Application of Rules. All entrants must review and agree to these Official Rules. By entering the Sweepstakes, each entrant warrants that he/she has read and agrees to abide and be bound by these Official Rules and that he/she is not prohibited from participating in the Sweepstakes. Submission of an entry automatically constitutes entrant's agreement to be bound by these Official Rules. Entrants further agree that Sponsor shall retain full authority, in its sole discretion, to interpret and administer these Official Rules, and to be bound by all decisions and interpretations made in good faith by Sponsor. To enter, visit the Sweepstakes website, https://bigdreams.stonyfield.com ("Sweepstakes Website") during the Sweepstakes Period. Navigate to the Sweepstakes entry page, (i) complete the entry form, including your full name, e-mail address, zip code, and the minor child(ren)'s first name and birth month and year who appear in the Photo (as defined below) uploaded with your entry; (ii) confirm that you are 18 years of age or older at the time of entry in the Sweepstakes (or in the case you reside in a jurisdiction where the age of majority is greater than 18 years of age such age of majority under the laws of that jurisdiction); (iii) upload a Photo (as defined below) compliant with the requirements set forth in these Official Rules; and (iv) submit a caption describing your dream for your minor child(ren)'s future. All required elements of an entry must be submitted at the same time. Entrants may also opt in to receive Sponsor's newsletter, but are not required to in order to enter the Sweepstakes. Materials submitted to Sponsor by entrant shall not contain any protection feature designed to prevent its use, or any computer virus or other similar programs. Entrants acknowledge and agree that their respective entries become the property of Sponsor, subject to these Official Rules, and will not be returned. Upon submission of an entry, entrant will receive a pop-up notice, with a unique link to provide to other potential entrants. Entrant will receive one (1) additional entry if (i) entrant's entry is posted to the Sweepstakes Website, (ii) the unique link is utilized by a separate entrant to enter the Sweepstakes, and (iii) such separate entrant's entry is also posted to the Sweepstakes Website. Limited to twenty (20) additional entries through this method during the Sweepstakes Period. When can I enter the sweepstakes? You can submit your first photo beginning August 13, 2018 at midnight EST and once a week until the sweepstakes ends on September 9, 2018 at 11:59 p.m. EST. It's a check for $10,000! Wouldn't that be great to use for your child's (or children's) education? What do I submit to enter the sweepstakes? Snap an oh-so-adorable picture of your child (or children) between the ages of 6 and 24 months, and submit it along with a brief caption describing your dream for his/her/their future. Make sure to review and agree to the Official Rules, too. Do I have to buy Stonyfield products to enter? No—there's no purchase necessary to enter or win. But still, who wouldn't want the delicious YoBaby cups in the fridge? You can submit an entry once each week during the Sweepstakes Period! Keep those submissions coming! Visit the Official Rules for more details. How will I know my entry has been received? After you submit your entry, you'll receive a confirmation email confirming we've received your entry. If your entry is accepted, you will be sent a follow-up email letting you know your entry has been posted to the sweepstakes gallery page and officially entered into the sweepstakes. If your entry was not accepted (whoops, someone didn't comply the Official Rules), you'll have the opportunity to submit a new entry. Visit the Official Rules for entry requirements. Your odds of winning depend on the number of eligible entries we receive. When you enter every week, your odds go up! How do I refer a friend to get an additional entry? After you submit your entry, a pop up window will appear on your screen. In this window, you'll be provided a Referral Link that you can copy and provide to your friends and family to encourage them to submit an entry. After your friend submits an entry and his/her entry is posted, you'll receive an additional entry. If you submit a photo every week, you can refer friends every week too! Will other people see my entry? You'll get an email when your entry is approved and posted with a direct link to your entry. Copy this link to share your little one's photo with friends! Available on the YoBaby Sweepstakes page. Others can see your entry when posted in the photo gallery. The winner will be selected at random within two days after the submission period has ended. Visit the Official Rules for more details. After the winner has been selected, they'll get the exciting news by email within three days. Be sure to check your inbox! The lucky winner will be announced on or about September 28, 2018 and posted on the Sweepstakes Website. 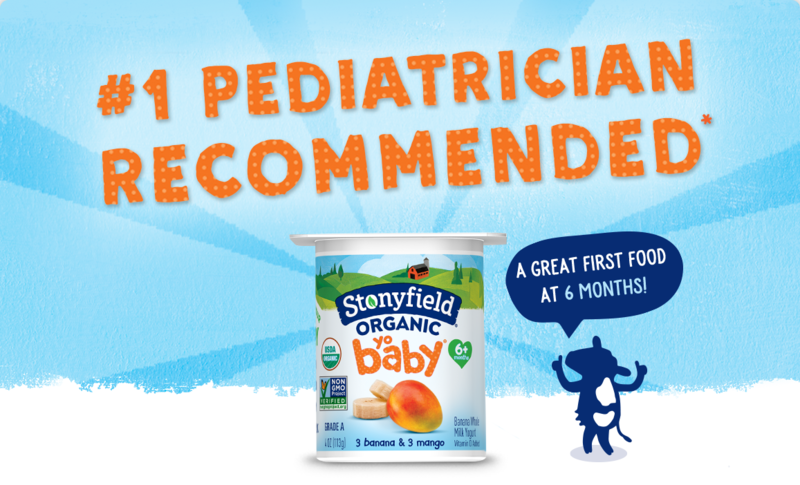 The winner may also be announced on Stonyfield/s Facebook, Twitter and/or Instagram pages.